We are pleased to welcome noted Greenock dramatist Danny McCahon back to the blog. A professional highlight for Danny in 2018 was the debut performances of his play “Where’s Lulu”, about the Scottish songstress, to wide acclaim. On a personal note he cut a fine figure in his kilt at the wedding of his eldest daughter Anna. She has two sisters so we look forward to Danny’s legs getting further outings in the future. Telly’s crap, innit? Come on, we’ve all said that. This year, this month, probably this week. And the older I get the more I’m saying it. But . . . If we believe life is made up of a series of moments, some planned, some surprising and some that kick us right in the emotions, tiny moments in drama are the stuff of entertainment. It might be a witty line, a withering look or a cunning stunt that embeds a moment, a scene, a movie in that part of our being where we store our favourites. More and more I am finding those moments, for me, are underpinned with music. “Almost Famous” might be one of my favourite movies and top among its moments is a scene on a bus where a group of band members and liggers remember why they love each other: a rousing, untidy singalong version of an Elton John song. Then there’s that moment in “A Knight’s Tale” when we realise that the 14th century revellers’ dance accompaniment is segueing into Bowie’s “Golden Years”. This year I enjoyed the Getty kidnap series “Trust” and when people asked what I was enjoying about it, I regularly found myself saying ‘great cars, great music’. “Trust” used well placed period tunes to enhance the action, but the series I think used music best were a bit more subtle with their soundtracks. 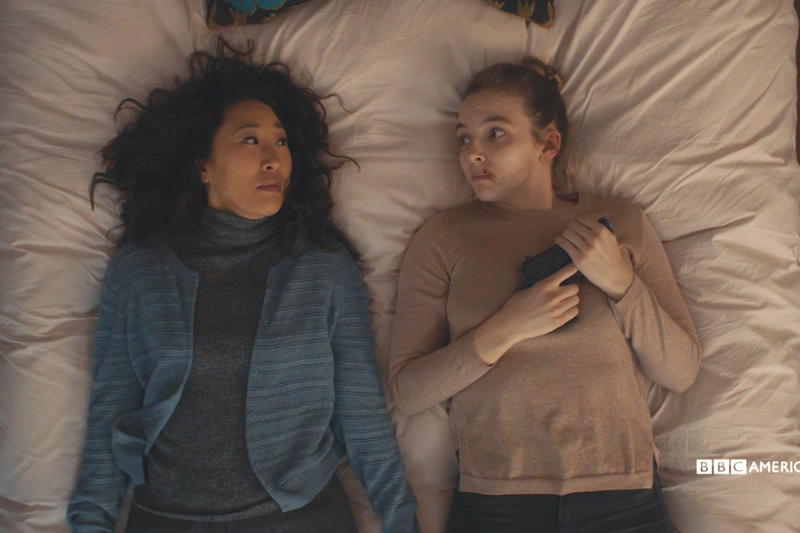 The outstanding show of 2018 for me was “Killing Eve” and its unobtrusive music, much of it drawn from David Holmes’s Unloved album “Guilty of Love”. That marriage of sound and image proves for me that TV did not die in the 20th century. is everyone’s favourite Lauren speaking to Mr Holmes about his part in creating the hit series. We all love Roxy Music, aye? We’re a bit less sure of Ferry’s solo work, aren’t we? One thing that courses though all of his collective opus is a hint of decadence, a decadence in a time that might never have existed beyond the unreality of vinyl or celluloid. This year Netflix lured us back to the Weimar Republic of pre-war Germany with “Babylon Berlin”. I didn’t find the series quite as enthralling as many of my friends, but I did like the big choreographed night club scenes. I loved the music, especially when it threw up a new arrangement of a song I’d held dear since my teens. And it seemed the most natural thing in the unreal world of TV when Mr Ferry himself cropped up entertaining the decadent Berliners with an orchestral version of Roxy’s “Bitter Sweet”. He looked so at home, like he had found the fictitious place his songs had been searching for all these years. Closer to home, in time space and reality, two of my favourite comedy series in 2018 have come out of Ireland. I am yet to meet a single person who was not charmed by the young characters in “Derry Girls”, but something further south captured more of my attention. And my heart. 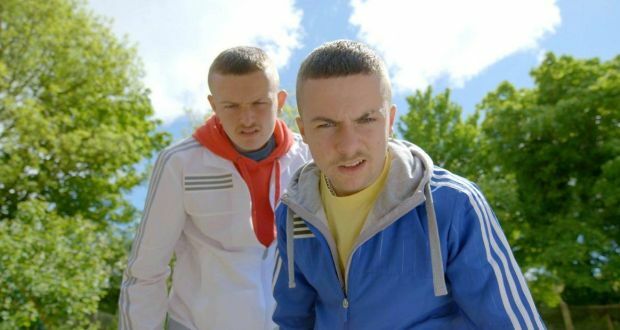 Coming of age comedy “The Young Offenders” follows the trials and tribulations of two wee rascals learning to cope with life in Cork. It has its hilarious moments but is shot through with real humanity and the viewer can’t help but root for Conor and Jock. If the lads have a nemesis it’s the local nutter Billy Murphy. Like a kid with a scab they just can’t leave him alone and, like a picking a scab, they just keeping making their relationship with Billy more intense and more dangerous. One outstanding moment has music at its heart, music by Cork’s own The Frank & Walters. Billy has hijacked a bus full of passengers, including our heroes, and having run out of ideas of what to do with it, he leads a singsong. Go on, tell me that’s not brilliant telly. As regular readers (a big “Hello” to both of you) will know this past month I have been mainly listening to & writing about Soul & Funk, music that continues to fascinate & delight. I do still keep an ear on new Rock music but, for me, much of it sounds like something that has not only been done before but done better. Currently the only non-Soul records at the front of the stack are much-played discs by XTC & Teenage Fanclub (oh & Steely Dan…always the Dan). News of a new release by a guitar hero of mine has piqued my interest & caused me to temporarily give up the Funk to investigate further. 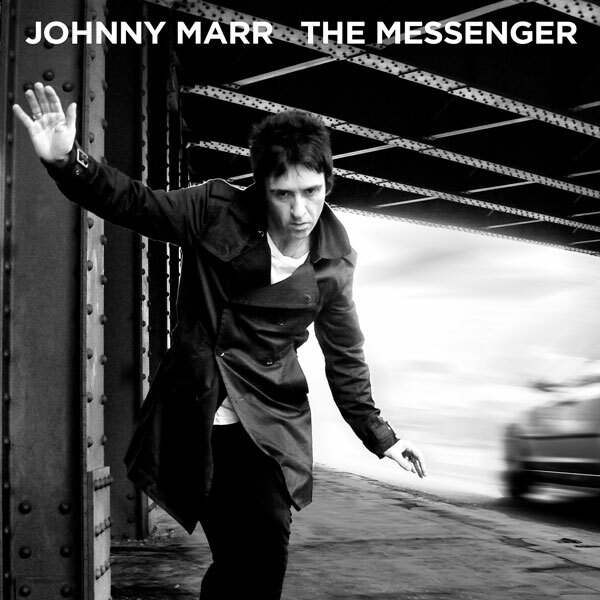 “The Tracers” is the first track to be released from “Call the Comet”, the upcoming album from Johnny Marr. Of course Johnny is always going to be best remembered for his work over 30 years ago (I know!) with the Smiths. His layered soundscapes perfectly framed Morrissey’s sometimes downcast, always droll lyrics to revitalise British guitar music & make them the best band in the country. After the break-up he became a guitar-for-hire, content to add quality to whatever took his fancy. The 3 Electronic albums with Bernard Sumner off of New Order & others are the only ones where he has put his name to the songs & stepped to the front of the stage. This will be the third solo LP by Marr & I will be on it because I took too long to get around to the previous two. “The Messenger” (2013) is up there with the best records of the decade. No new ground is broken but from the rush & the push of the opener “The Right Thing Right” through to the dead stone classic “New Town Velocity” its capacious jangle, anthemic without bombast, updates a quintessential 1980’s Manchester sound. Of course the music can remind you of his old band, it’s what Johnny Marr does. He’s not from the traditional axeman hero mould. He has some pretty good Rock & Roll influences along with the taste & imagination to incorporate them into his own distinctive, melodic playing. His proficiency in creating the sound of the Smiths brings to mind Tony Hicks off of the Hollies, another Manchester guitar hero of mine who knew how a great Pop single went. So, what’s on the TV then? Nothing much, I know. I binged the latest series of “Schitt’s Creek” in 2 days because, except for the new batch of “Curb…”, it’s the only comedy that makes me laugh out loud. Yesterday I discovered how to edit the “continue watching” on Netflix so that’s a whole lot of disappointment out of my life for ever. The one series this year that has had me hooked, good enough to make me want to consider what I’ve just watched, too good to rush onto the next episode is “Counterpart”. “Counterpart” is a parallel universe spy thriller set in the two Berlins, one in the Alpha world (that’s ours) the other in the Prime world ( the same as ours but different). The only portal between the two is strictly controlled but, people being how they are in any world that they hook up to, there are bad things going on & these things get messy. It’s a 10 part season, light on the science, heavy on the fiction, which takes its time in telling its tale. The series is anchored by two star performances by J K Simmons. In a complex plot you usually know which of the Howard Silks you are watching from his demeanour. The supporting cast includes the “always watchable” Olivia Williams, Richard Schiff, Adeel Akhtar & its good to see Stephen Rea, a fine actor, with a meaty part. “Counterpart” may not be for everyone, there are plot holes which will give sci-fi pedants a bumpy ride. Its concerns with Love, loss, & identity kept me watching & the arrival of “The Management” in the final episode has me waiting eagerly for series 2. OK, the new series of Legion” starts this week. I’ll watch but if it keeps messing me about with whole episodes that never really happened then I have an off switch on my remote & I’m not afraid to use it. Later this month sees the return of Jim “Brockmire”, a series I did find to be funny first time around. In the meantime it’s back to the Netflix to see if there’s anything that I want to “continue watching”. 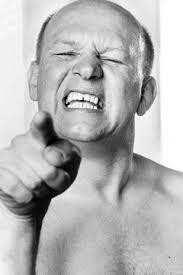 Brian Glover is best & probably rightfully fixed in popular memory for his very first acting role. He had previous dramatic experience as a professional wrestler where he inherited the nom de scene “Leon Arras, the Man from Paris” when the “real” Leon failed to show, His day job was teaching English & French at Barnsley Grammar School in South Yorkshire where he himself had been educated. When his friend & fellow teacher Barry Hines’ novel “A Kestrel for a Knave” was adapted for the cinema the author recommended him as the ideal candidate for the role of Mr Sugden, the Physical Education teacher. 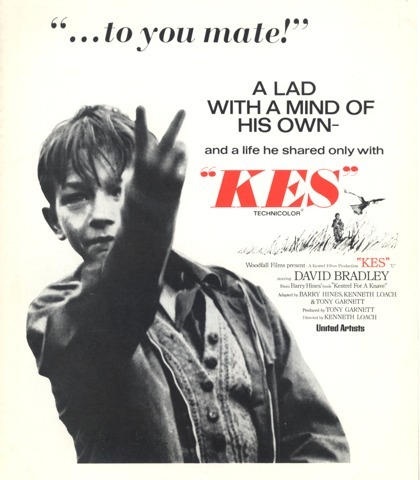 “Kes” (1969), directed by Ken Loach, is an absolute coup of a movie which should be shown in schools around the world (though possibly with subtitles for those living outside the North of England). Loach had previously made some of the best British social realist films of the late 1960’s. “Up the Junction”, “Cathy Come Home” (both made for TV) & “Poor Cow” were effective in highlighting & stimulating debate about the issues facing working class women. His story of a boy’s potential thwarted by an unsympathetic education system & by his family situation is enhanced by the use of a mainly non-professional cast. It certainly felt that you were watching a kid you knew living a life you recognised. Brian Glover was so convincing as the casually brutal Sugden, living out his Bobby Charlton fantasies (Denis Law was in the wash!) in a games lesson. Funny because every one of us had experience of his like. Those who can’t do, teach & those who can’t teach, teach PE. If a blunt Yorkshireman, who likes what he says & says what he bloody well likes, was required then Brian Glover was in the frame. His starring role as a dictatorial band leader in “Sounding Brass” (1980) didn’t extend beyond 6 episodes but his guest appearances in sit-coms were often memorable. “No Hiding Place” was an outstanding episode of “Whatever Happened to the Likely lads” when Flint (Glover) attempts to spoil our heroes, Terry & Bob’s plans to avoid the football score (these things matter!). The rather dim Cyril Heslop in “Porridge” provides the title of this piece. There were a couple of episodes of “Doctor Who”, in “Campion”, an adaptation of Margery Allingham’s detective novels he stole the show as sidekick Lugg. Of course when we put the kettle on (which we do a lot here) we still hear his voice from the Tetley Tea adverts. At a time when British TV’s most successful exports are nostalgic gee-gaws about an elite class (“Downton Abbey”, “The Crown”) it is worth remembering the time when we made the best original drama in the world. 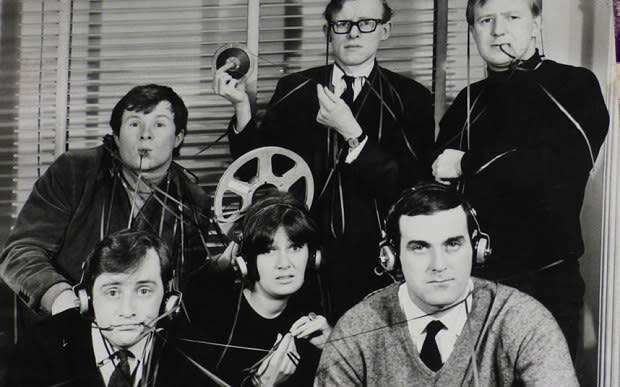 Beginning with the BBC’s “The Wednesday Play” & continuing with strands of one-off plays across all channels (all 3 of them) space was given for many talents , on both sides of the camera, to emerge, develop & tell stories from all levels of society. Brian Glover’s first “Play For Today” was Ken Loach’s shopfloor activism drama “The Rank & File” (1971). 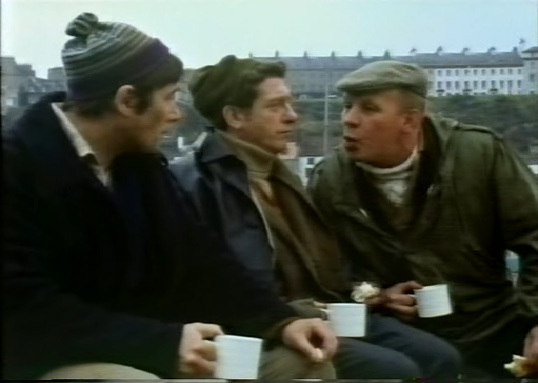 The following year “A Day Out”, written by Alan Bennett, directed by Stephen Frears (now that’s a pairing) was followed by “The Fishing Party”, the story of a weekend in Whitby for 3 miners. Peter Terson had first come to our attention with his play for the National Youth Theatre “Zigger Zagger” (1967), a boisterous commentary on the culture of football supporters. Glover starred as Art. He, Ray Mort, another fine character actor (Ern) & Douglas Livingstone (Abe) were outstanding in a funny, touching entertaining piece. So much so that the playwright reunited the characters in “Shakespeare or Bust” & “Three for the Fancy”. It says much that over 45 years later these plays are so fondly remembered. You can see “The Fishing Party” here. Glover himself wrote 2 slice of life dramas for the series, “Keep an Eye on Albert” (1975) & “Thicker Than Water (1980) which concerned a black pudding festival! He appeared in some good movies too. “O Lucky Man!” (1973) & “Britannia Hospital” (1982) are parts of Lindsay Anderson’s Mick Travis trilogy. “Jabberwocky” (1977)”, he was an ideal terry Gilliam character. He’s playing chess in “American Werewolf in London” (1981) & there’s “The Company of Wolves (1984). 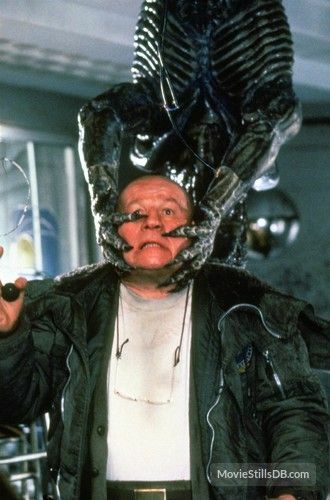 Then, of course, he did his turn as Andrews in David Fincher’s “Alien3” (1992)…oh that’s who he is!. “Red Monarch” (1983) is a made-for-TV film which is a sharp study of the tyranny of Stalin’s inner circle with an excellent cast. Glover contributed to a fine production with his portrayal of Nikita Kruschev. He barely makes the above trailer but he’s around the film. 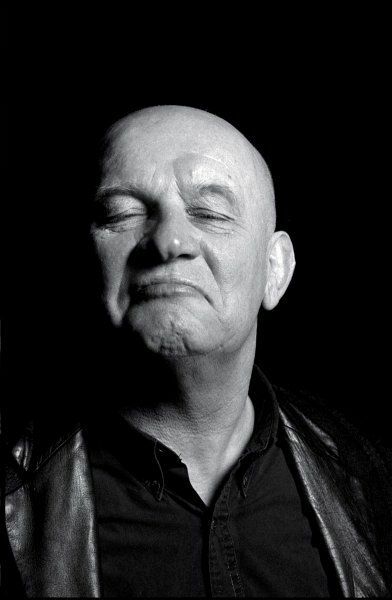 The word I have kept wanting to use about Brian Glover is “memorable”. After the impact of “Kes” he only had to walk on to a screen, large or small, & you were pleased to see him. He wasn’t an actor who disguised himself for his roles & he may have been as Yorkshire as the Pudding but was more than a professional Northerner. “What’s that for Sir?” “Slack work lad, slack work”. Love the guy. I first became aware of Liz Smith, who died this week aged 95, in 1973 when she starred in “Hard Labour”, a BBC TV drama directed by Mike Leigh & produced by Tony Garnett. The weekly “Play for Today”, like its predecessor “The Wednesday Play”, was a forum for many emerging British talents. The strand encompassed a wide variety of styles & subjects. It was the hard-hitting & effective social realist themes, a development from kitchen sink dramas of a decade earlier which often provoked controversy. 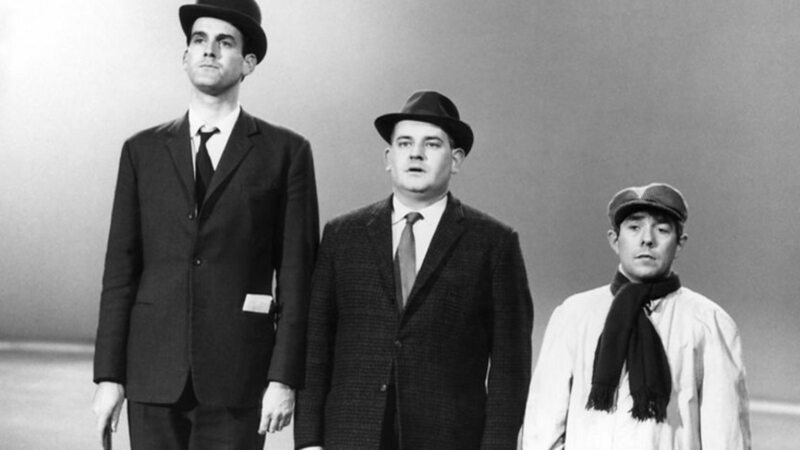 “Hard Labour” was Leigh’s first TV play, it employs his improvisational technique to achieve a naturalism & a bleakness unleavened by the humour to be found in his later work. Mrs Thornley, harassed by her husband, patronised by her middle-class employer & offered no solace by her religion, is a study in isolation & limited communication. Liz Smith was outstanding in the part & she broke our hearts. There’s very little of “Hard Labour” on the Interwebs so let’s move on a couple of years to her next starring TV role. 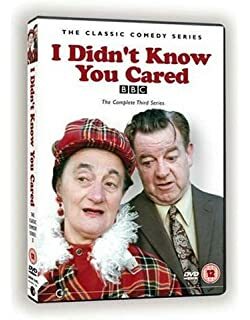 “I Didn’t Know You Cared” was a sit-com adapted from his own novels by Peter Tinniswood. It ran for 4 series from 1975-79, another slice of Northern life, this time across the Pennines in Yorkshire. The Brandon family were a wonderful parade of absurd characters, the men cloth-capped, gloomy & cynical, the womenfolk keeping a close eye on them & their faults. It had a terrific ensemble cast, was tougher than the long-running “Last of the Summer Wine”, with the gentleness & acerbity of Alan Bennett. At the heart was Liz Smith’s Mrs Brandon, hen-pecking, haranguing & hilarious, nailing some of the best lines of a very good bunch. Some right old toot from the same period is now recycled on the nostalgia channels with no sign of this classic British comedy. Ms Smith was in her fifties before this acting thing really took off. Her talent to portray the slightly mad but always likeable Grandma found her plenty of work in film & TV & she quickly became a very recognisable character actor. Her cinema work included Lindsay Anderson’s “Britannia Hospital”, Ridley Scott’s debut “The Duellists” & she was Lady Phillippa of Staines in Viv Stanshall’s brilliant “Sir Henry at Rawlinson End”. She was perfect for the BBC’s adaptations of Dickens & appeared in Michael Palin’s “Ripping Yarns” classic episode “The Testing of Eric Olthwaite”. It would be 1984 before she gained recognition from her peers for her talents. Handmade Films, a British production & distribution company, was formed by George Harrison when his Monty Python friends were struggling to finance “Life of Brian”. The story goes that George had to mortgage a house but I don’t think that he ever went short. In the next decade Handmade were involved with many fine British films. “A Private Function” (1984) is as close as this to the gentle, eccentric comedies made by Ealing Studios in the 1940s & 50s. Alan Bennett was an international success in 1960 with “Beyond the Fringe”. He continued to act while becoming better known as a writer for TV & theatre. This was his first screenplay, perhaps having less substance than his plays but no less lacking in the acuity Bennett has for language & the intricacies of social interaction & manners. “A Private Function” is set in post-Second World War Yorkshire when food was still rationed. The social climber Joyce Chilvers (Maggie Smith) is determined to make her mark in the town & intends to drag Gilbert, her chiropodist husband, (Michael Palin) along with her. A pig, being illegally fattened for a municipal celebration is kidnapped by the Chilvers & hilarity ensues…really it does. Along with the great writer & the two illustrious principals the cast involves an overflowing National Treasure chest. Denholm Elliott, Alison Steadman, Pete Postlethwaite & others all do their distinctive thing while Liz, as Joyce’s mother, driven mad by the smell of the secret pig, thinking that perhaps she could be the source of the odour, won the BAFTA for Best Supporting Actress. Liz continued to do the work, adding value to whatever she appeared in. 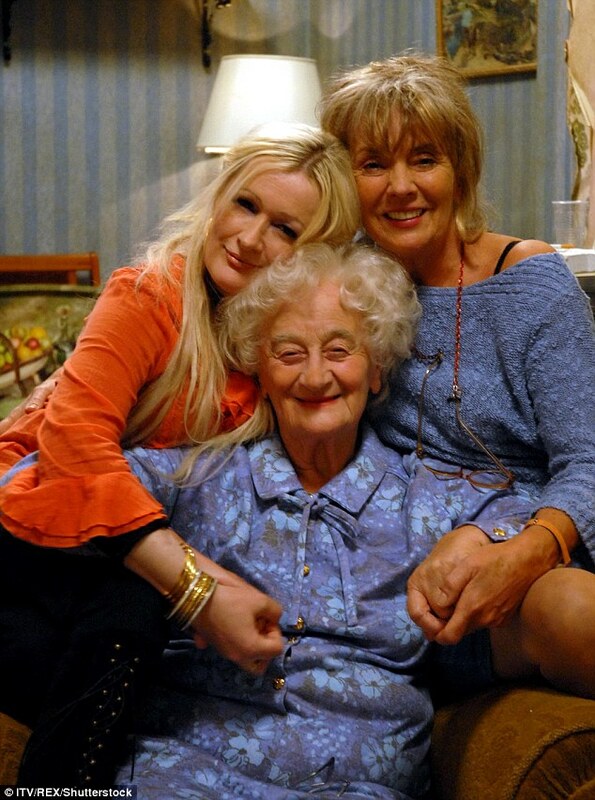 In 1998 she was cast as Nana Norma in Caroline Ahern’s comedy “The Royle Family”.By this time she was 76 year’s old & the nation’s favourite grandmother, perfectly cast in a series which, along with Ricky Gervais’ “The Office” & Steve Coogan’s “I’m Alan Partridge” injected new energy & raised the standard of British situation comedy. “The Royle Family” was sometimes a kitchen sink drama but it was mostly on the living room sofa in front of the telly. The skillful characterisation, the pacing, the natural humour & affection made many people suspect that Aherne had placed a spy camera in their own homes to obtain material. This clip, from the 2006 special “The Queen of Sheba” where the new baby is introduced to the bedridden Nana will moisten the driest of eyes. A starring role in the UK’s most popular comedy brought Liz Smith even wider recognition &, in 2007, a British Comedy Award for Best TV Comedy Actress. Liz Smith was born in my hometown in Lincolnshire. She’s from the Crosby area up in the north of town. She attended the secondary school which, years later with a change of name, in a different building became my school. That may be why, even in those early days before I knew of her origins, I found her performances to be so convincing. She reminded me & so many others of our own grandmothers except that perhaps my Nana Daisy actually knew her as young Betty Gleadle. Sad events have made this appreciation into an obituary & that’s a pity. It’s OK because I am reminded of the talent of Liz Smith by the old ladies I talk to at the bus stop, in the market & around my estate. For these women, who have lived through some times, have seen & learned some things, Liz Smith represented.